I saw this guy in this month's Warhammer Visions from the Golden Demon coverage and was immediately impressed. 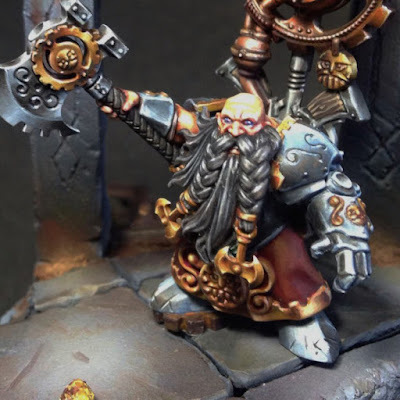 I generally liked all of the models that came out of the newest Dwarf release last year, but I did not like the new Engineer special character very much. He just seemed to cartoony and ridiculous for me. Well, I have been proven wrong. By simply using the open left hand option over the one holding the gun and swapping the head with the Slayer model this hobbyist has completely changed the feel of the model. There was a little bit of sculpting work to make the new head fit the body and cover the gap where the mohawk normally went, but beyond that I believe everything else is just plastic. The sweep of the beard and manic look in his eyes really help reinforce the way he is thrusting his axe out. I can just imagine this guy yelling something about killing some dirty Grobi. I'm usually not overly enthusiastic about NMM paint jobs, but this one is just to nice to ignore. Sometimes I feel like it can just come off as showing off, but it really helps reinforce the model here. The red of his skirt is nice and subdued as well to let the metal and skin take center stage. The scenic display is simple, but undoubtably Dwarfish. It doesn't distract the eye at all, but has enough detail to keep your attention. This is the perfect balance to strike when making a scenic base for a model. You can't tell from these pictures, but there's a busted up miner's railway leading to the doorway behind him. 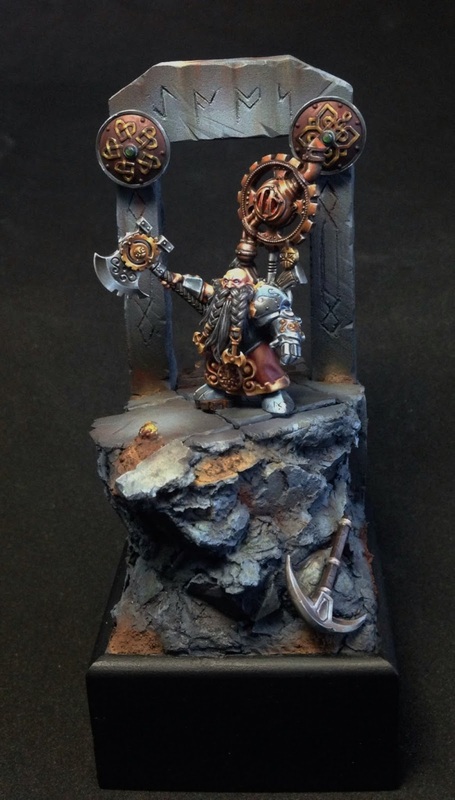 All around a great mini and one of the most unique things I have seen done with the new Dwarf models. Be sure to check out more views of it on Cool Mini or Not and show the artist some love if you like it. You can also find more pictures and other models at his personal blog, Goldfish of Justice.